You are here: Home / Inbound Marketing / Are You Making This Mistake With Your School’s Blog? We launched our school blog roughly five years ago when we started implementing inbound marketing at Sewickley Academy. Our blog launched with three goals in mind: Increase inquiries, help with branding and improve our search engine rankings through search engine optimization (SEO). While all three goals are benefits of blogging, in my opinion, using a blog to increase inquiries is the most important and the goal that I most often see not implemented properly or not at all. What is the biggest mistake schools make with their blogs? The biggest mistake is not including a call-to-action at the end of every blog post. Let’s discuss the theory behind launching a blog at your school and how to properly convert a prospective family visiting your school blog into an inquiry. To convert a prospective family into an inquiry, you first need to “attract” that family so that your blog can be found by them. This is the definition of search engine optimization. More specifically, SEO is a collection of techniques and practices that allow your school’s website or blog to show up in a search result for a particular search term. By way of example, my school, Sewickley Academy, is a “Pittsburgh private school” but when we first started using inbound marketing we didn’t show up on the first page, second page, or even the third page of Google’s search results for that particular search term, “Pittsburgh private school.” Using search engine optimization techniques, we were able to improve our results and now very frequently show up in the first three slots in the Google search results on the first page – a huge improvement. 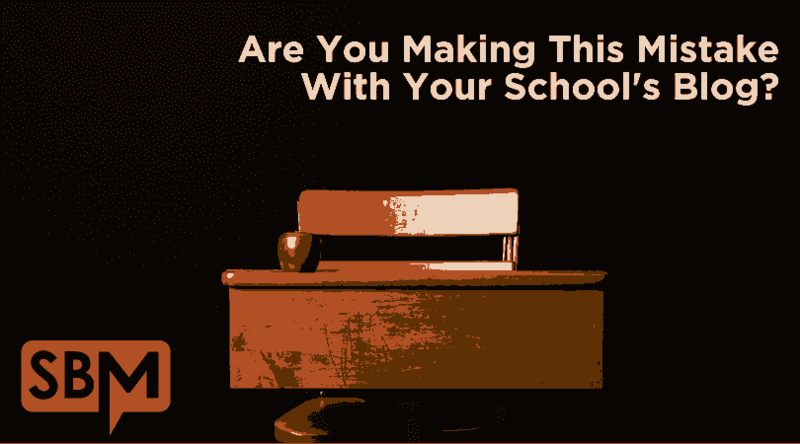 Proper utilization of SEO would have my school trying to rank for 25, 50, or even 75 search terms so that we help a prospective family find our school. Now that a family can find our blog we need to convert them into inquiries. How do we do that? At the end of each blog post, we have an image with a single call-to-action. For us, that call-to-action offers prospective families a guide or ebook that provides value to those families, and while the guide is available to them for free there is still a transaction involved – we provide the guide, and they provide us with their email address. This transaction is the single most important purpose of having a blog at your school. If you are, I hope you change it as quickly as you can. Great question and I understand your frustration. I’ve shared our blog traffic from January 2017 here: http://sbmedia.us/2kvDCQW. I can tell you our traffic hasn’t always been this high. It’s been a long, slow process that does take time but it does pay off. While I haven’t looked at your blog to evaluate the content, the one piece of advice I always give is to make sure that you are not using the blog as a news place to share news stories about your school but rather, publish content that would be attractive to your ideal prospective family. Hope that helps! You don’t necessarily have to self-author the ebook or guide; you could repurpose content you already have. The way I like to think about it is what could you offer that would be so appealing/helpful to parents that they would pay for it but you’re actually going to give it away for free. Hope that helps. Do you have to self author the ebook or guide? if so, how did you go about doing this? Although we maintain a blog, I am discouraged by how few people visit it, in spite of promoting new posts on social media and in eNewsletters to parents and alumni. Can you share how many viewers you expect to a typical post on the SA blog? And how you have built your audience?